We’ve been having such a great time at the Farm Cooking School that I wanted to continue to share our experiences with you. Even if you’re not totally into cooking, at the end of each class, you get an amazing meal and you might just learn something. So it’s worth taking a class or three. Plus, the school is practically on the Delaware, so if fits in perfectly with the theme. 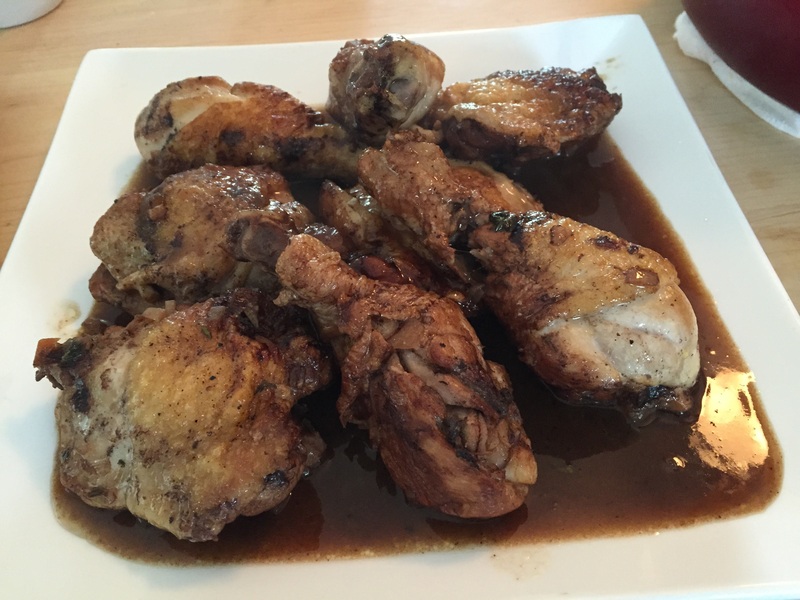 In class 3, we learned about wet cooking – braising. I always had the misconception that braising was when you ladled broth over something to cook it. But no, it’s much simpler than that – it’s cooking with the main ingredients partly immersed in a broth of some sort. The simmering broth cooks the ingredients as does the steam it produces. The result is usually extremely tender and flavorful as the process tenderizes the food and develops the flavors. Today, we were making two different braised chicken recipes with very different, yet compatible, flavor profiles. One was a Sri Lankan coconut chicken. The other was balsamic braised chicken. Both were incredibly aromatic and flavorful. More on this later. If those two dishes weren’t enough, we started our meal with mussels with sofrito – a delicious mixture of bell pepper, garlic, cumin, onion, cilantro, oregano and white wine. Yep, it was as delicious as it sounds! 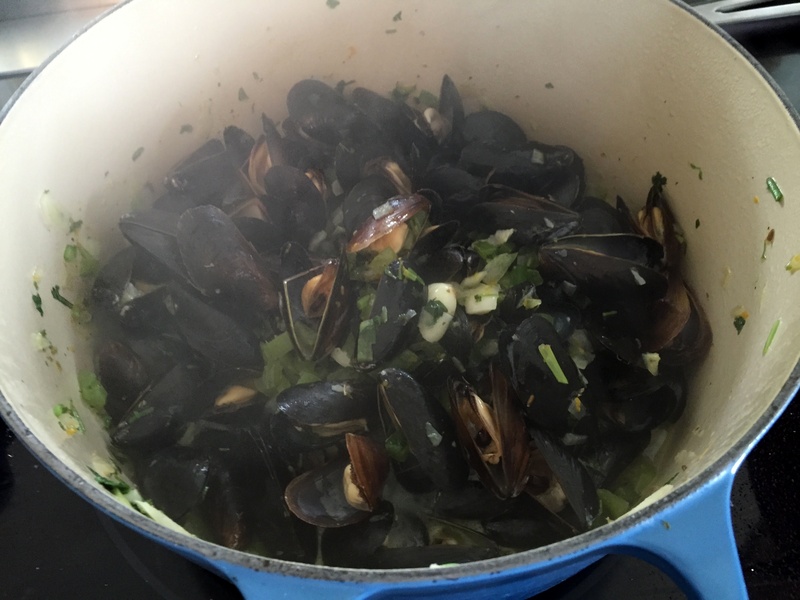 The ingredients melded wonderfully together, flavoring the mussels and leaving broth that of course we soaked up with chunks of baguette. We cooked the mussels last since they cook the quickest. This proved to be a good lesson – you really have to plan out your menu. As it turns out, we prepared the dessert, a Pavlova, first. So we started the day learning how to make a meringue. 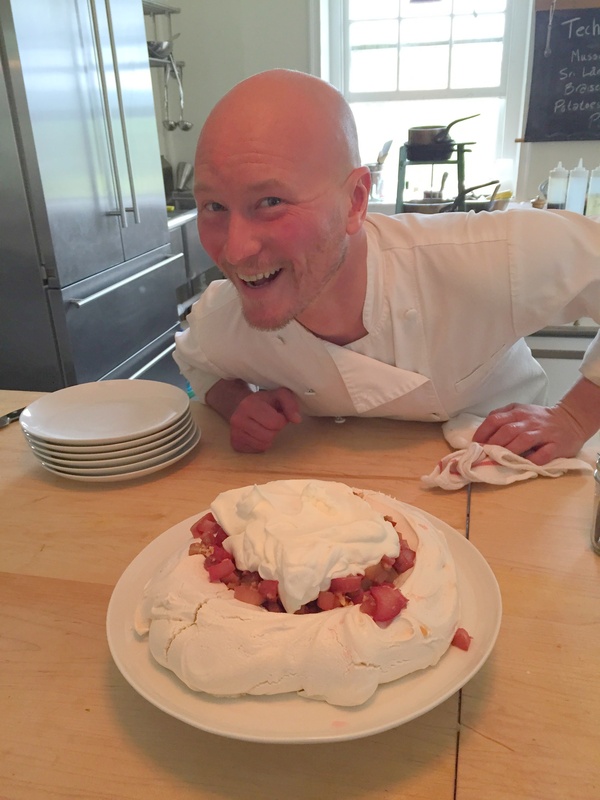 Did you realize how easy it is to make a meringue? Some egg whites. A bunch of sugar. Some lemon juice and corn starch and a nice stand mixer. Within a few minutes, you have this beautiful meringue! Then off into the oven for a long, low-temperature cook. Just too cool. This particular Pavlova had a roasted rhubarb filling. Do you know how nasty rhubarb is before dosing it with sugar? I’m telling you, sugar turns a lot of inedible crap into stuff that I could eat all day! One of the things we’re learning in these classes is how delicious you can make things using just a handful of ingredients. For example, the balsamic chicken is pretty much chicken with salt, pepper, onion, carrots, celery, thyme, vinegar and chicken stock. Yet it was my favorite dish of the day – definitely something I’ll make again. The Sri Lankan chicken was by far the most complex dish we’ve made. That has 15 ingredients beyond the chicken! It gave me a greater appreciation for the complexity of flavors we experience in food from that area of the world. And yet, preparation was remarkably easy for such a flavorful dish. The day was filled with a bunch of little revelations, as have been each of our classes. These make the classes far more valuable than the nominal fee we pay to take them, especially given the gourmet meal we get at the end! 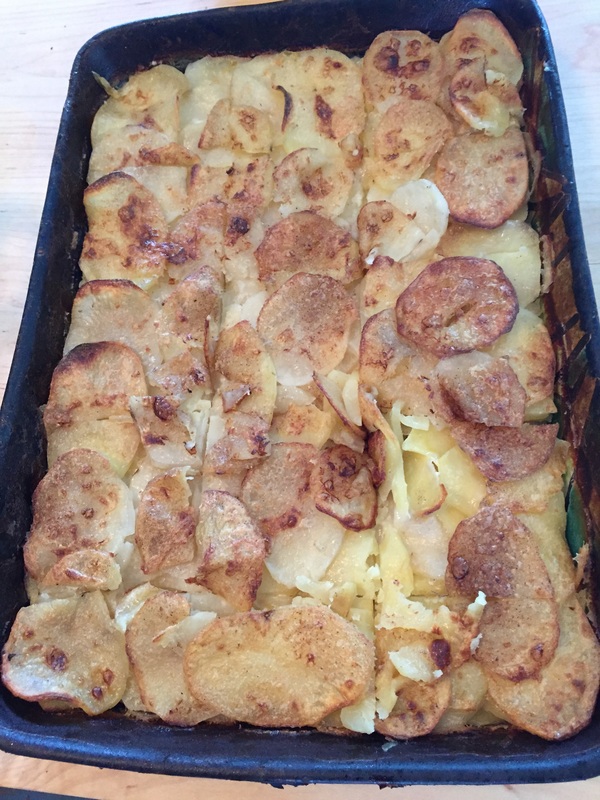 The final surprise for me was the Gratin Dauphinoise. We’ve all had a decadent potato dish – layers of potato, cream and cheese in hot, gooey mess. So delicious. So fattening. Something you eat rarely (due to a fear of clogged arteries), but then are tempted to eat the entire pan because it’s so delicious. Well, what I learned today was that you don’t need cheese in this dish for it to be drool-worthy! The dish we prepared just had potatoes, salt, pepper, a dash of nutmeg, garlic, butter, milk and cream. And not a crazy amount of butter and cream either. And yet, if you asked me, I would have sworn it was full of cheese. I am definitely making this dish again. It was so simple but really, really good. Perfect for a dinner party. After our third class, I feel even more that this fundamentals class is more than worth the cost. We’re learning general cooking methods that will serve us for a lifetime, combined with specific dishes that anybody would be proud to serve. I’m going to be less inclined to spend money for a typical restaurant meal that’s inferior in flavor and preparation to what we’re making. On the other hand, I think I’ll appreciate the artistry and talent that goes into making an exceptional meal, like the one I describe here.